She has a really good voice but I’m just not into her facial expressions. It just sounded like her voice was hurting throughout the whole song. JYP says that you could tell that all she could think about was the high notes and I agree. YG casts her with high hopes that she’ll improve. It didn’t even sound like they were sick. If I were to just listen to their performance and not know their backstory, I wouldn’t have known. I really think that them not being able to practice the song in full helped in their favor. It made the song flow and it didn’t sound restricted which a lot of the “vocalist” contestants usually sound like. Ma Eun Jin gets cast by YG and is the only one of the pair to get cast. She’s cute. There’s no doubt about that. But there’s something missing from her performance. I’m not sure what it is and it could be that she’s only 11. Or it could be that she doesn’t have a lot of strength yet to fill a whole stage on her own. But according to JYP she was born to be a star. We’ll have to see a few years from now. JYP casts her and this girl has her priorities straight. 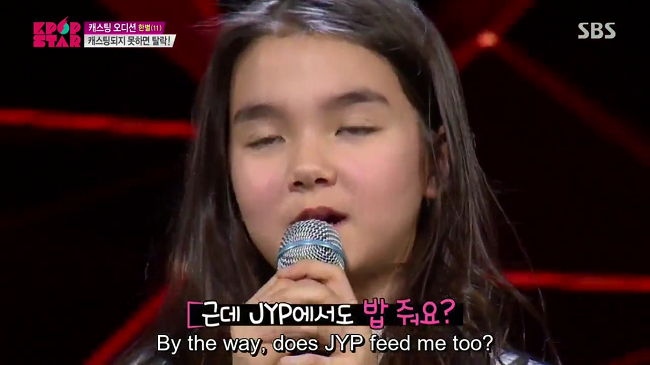 She asked if JYP will feed her, LOL. I feel like every time I see her, she gets prettier and prettier. And I love her more and more. Not just because of the look but her voice and style are really growing on me. I just kind of wonder if being in the k-pop realm is the right place for her to be. At this point, I really hope that Antenna casts her and if things work out well in the end, he’ll sign her. Ugh. She’s so good. She’s super pretty, super good at dancing, and a good singer. I do agree with JYP that she could totally stand on a stage alone. And she goes to JYP. YG sounds so sad. Just like TT. Oh my gosh, this was waaaayyyyyy better than their first performance. I’ll admit it, I was one of those salty people that thought that Chrisha Choo should have not been eliminated (though I don’t think my mind has changed about that). Whoa, Kim Hye Rim. She looks like the actor Lee Won Geun. Damn, she was hitting those notes. Kim Hye Rim gets cast by YG and is the only one to get cast.